Please read the following waiver and if you agree, click the button below and submit it. When you do, you'll be taken to a confirmation page, which will include a link to PayPal, where you can then charge your entry fee by credit card. 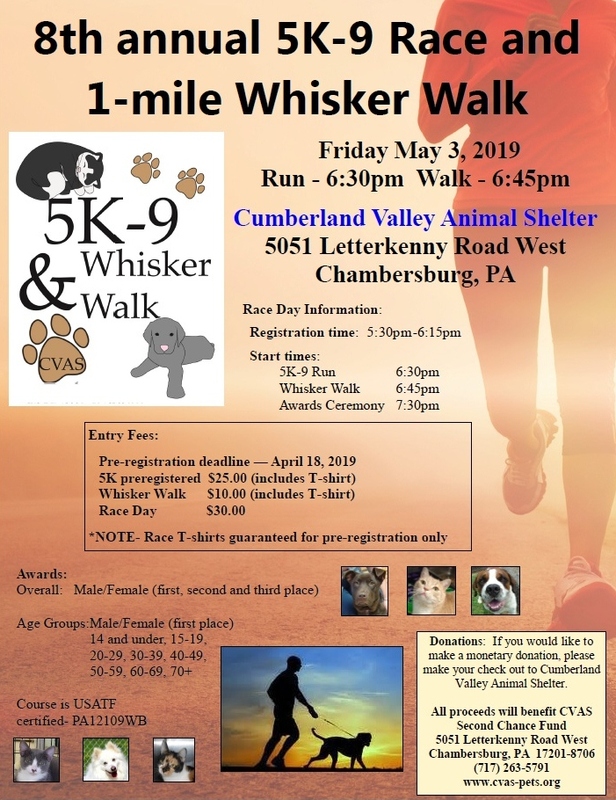 I understand that by clicking the submit button, I am providing the electronic equivalent of my signature and I waive all claims for myself, my animal, my heirs and assigns against the Cumberland Valley Animal Shelter, sponsors, coordinating groups and any individual associated with the event and will hold them harmless for any and all injuries or illness which may result from my participation. I further state that I am in proper physical condition to participate in these races. I give my permission to the media to use my name and or photo in any newspaper, broadcast, telecast or any other account of this event, without limited obligation of anyone to compensate me thereof. in these walks and/or races. I certify that my dog is up-to-date on vaccinations and has a current dog license. to transport to a hospital for further treatment.